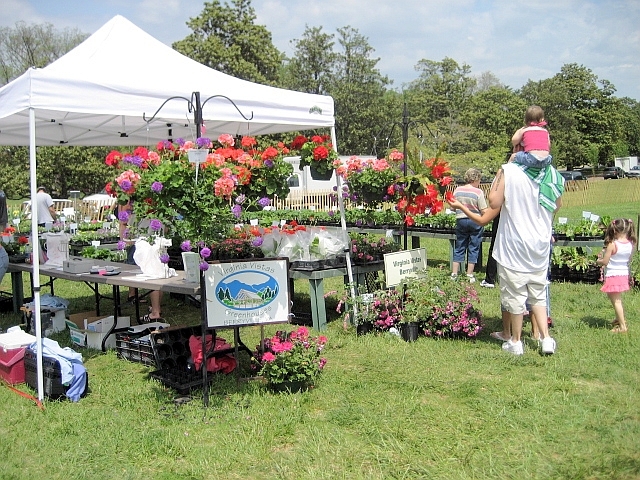 I had just a great time this weekend at the Maymont Herbs Galore & More festival with my mom and my aunt Patricia. The last little bit of sewing that I did in preparation was to whip up some quick little aprons from my scrap box for us to keep all of our change and bills in. 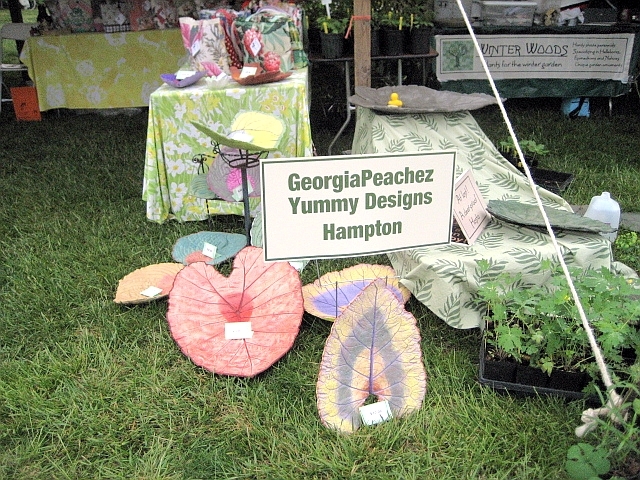 I could have sold these aprons at the festival several times over! Well, now we were prepared with our little aprons on, it’s off to Maymont! 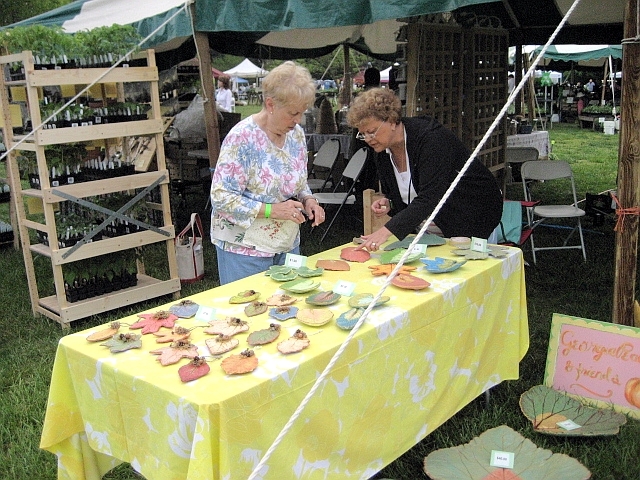 We had a huge booth space with plenty of room to set up the tote bags and my mother’s concrete leaf castings. The weather was perfect, not hot, not cold, just right. 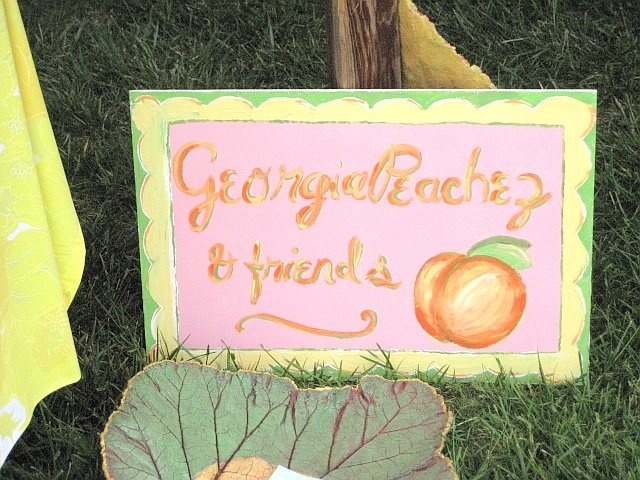 Beth painted the most fabulous sign for my booth that said "GeorgiaPeachez & Friends". That was so great of her, that’s why she is my best bud! Aren’t these leaves that my mom made just FABULOUS!! 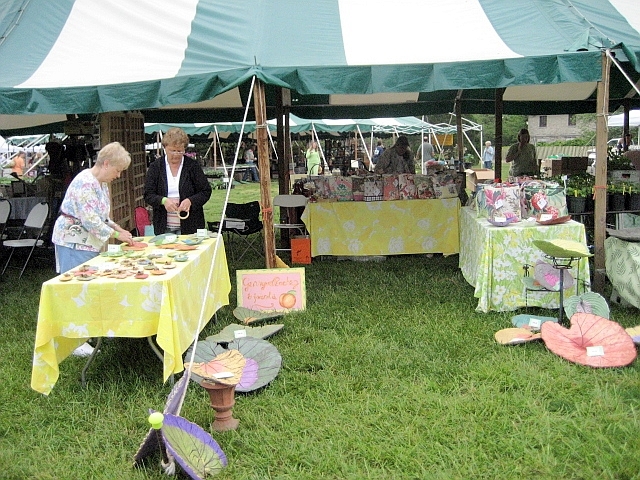 You can see a bit of the booth next door and she had some leaves too, but they were plain green. I just love all the colors that my mom uses for her leaves. They look just tremendous in the garden tucked in amongst the plants and flowers. We had such a great time. 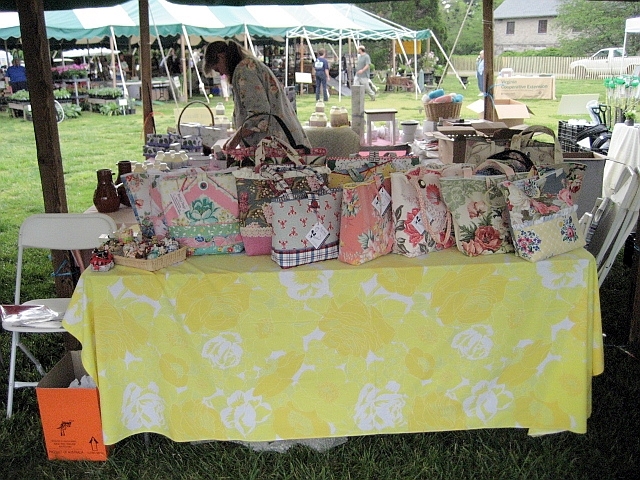 The totes that Beth and I made and sold were very well received. 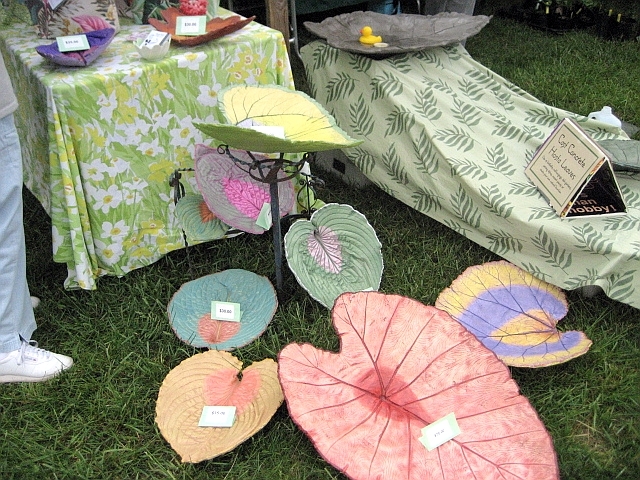 We made them primarily from vintage fabrics that had flowers and plants on them, after all this really was a plant sale! All of our leftover bags will end up in our eBay stores. My mother took home all the leftover leaves, now why didn’t I just steal all of them! I love all of your things but I would have bought one of those aprons in a second! Looks like you have a beautiful day. Hope you had a nice turn out. Setting up at shows is a lot of hard work. But, they sure are fun, esp. when you go with friends. Ohhhh what a fabbbb show!! Wish we lived closer!! And the bags…ohhh sooo fabulous!! LOVING the one right in front! It would be perfect for our lil family vacation this year!! I’m gonna hop over to your ebay store!..and Beth’s…I wanna blog you gals!! Anyhoo…Loved seeing these photos!! I am sure everyone went nuts over your stuff! !…and Mom’s awesome leaves!! 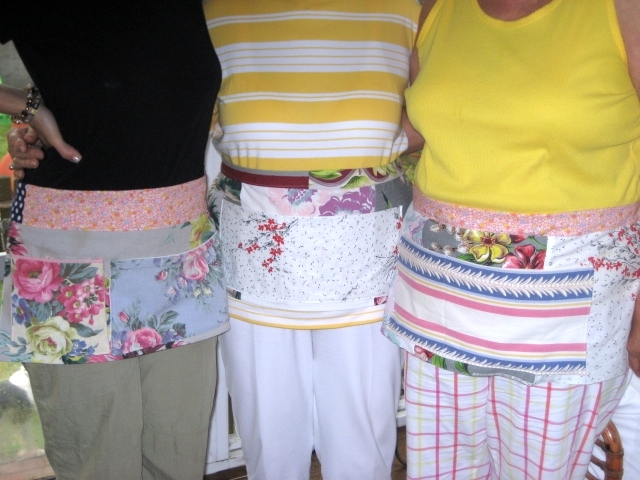 Love your APRONS!! Those are so sweet!! 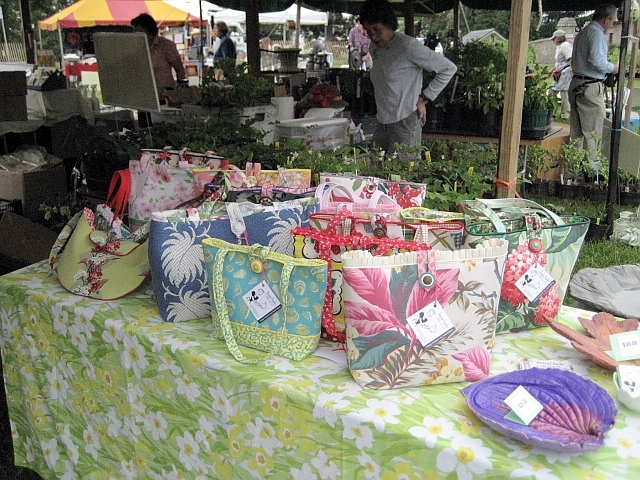 Also love your totes, so pretty!